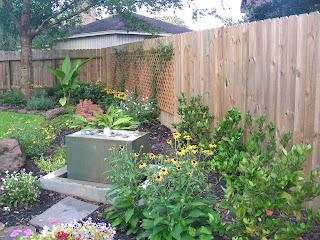 Wisechoices ...: How does "our" Garden Grow? How does "our" Garden Grow? Mari, Mari how does your garden grow? "It grows with love and prayer and a partner who talks to each and every plant daily!" Shortly after my last letter in which I declared I am worthy to prosper on all levels. I heard about new substance to help me heal my body from the inside out. My immediate thought was, “Yes, I am worthy of health and prosperity” so I decided to give it a try. I brought it home I enrolled my guy Gary in “Project Health” too. The result has been nothing short of a miracle as far as I am concerned. I am so excited about the results of a wonderful substance named Frequensea … Just to give you a bit of history, shortly after returning from the Viet Nam war in the late 60’s Gary developed massive internal bleeding. He finally had his stomach removed nearly 40 years ago in one of his many extended stays in the VA hospital. Keeping weight on him has been a chore. As a couple we look like Jack Sprat who ate no fat and his wife who ate no lean, yet Gary is a butter and sugar-holic. We both started taking an ounce of Frequensea everyday. I felt the energy of Frequensea like a shimmer running through my body as I drank it. It feels alive and energetic in my system. I have had more energy and vitality and have been sleeping so much better. Gary immediately stopped having the constant bowl complaint he has lived with and in fact has been stable since starting to take Frequensea. He is starting to gain weight and he feels more energetic and calm. He has been given a new lease on life and in just a few short weeks. What is so wonderful is that Frequensea goes to the cell with out going through our digestive system and liver so the all our cells are nourished and can help the body to heal. It is comprised of 100% pure Marine Phytoplankton. Marine Phytoplankton are single celled- plants that are responsible for making up to 90% of the Earth’s oxygen and are the basis of all other life forms on the planet. I believe so strongly in Frequensea and how it can help people to “live healthy”. I think it would be something everyone can benefit from. And because of this I want you to know about it first hand. Check it out by going to this website www.frequensea.com/marihall-2 there is an excellent short video called “Another Day” and find out how the amazing discovery of Marine Phytoplankton was made on a one of a kind $30 million Sea Farm. Please pay special attention to the amount of nutrients, minerals and goodies that are in Frequensea. It is LIVING. The Forever Green Corporation who sells Frequensea through distributors is growing rapidly. By getting in at the ground floor I am hoping to generate more income to have more time to enjoy doing what I love and in a way that speaks volumes about integrity. The company has a great message. What has impressed me in addition to the product itself is that where the plankton is grown in the Pacific North West, the marine life is returning, the estuary is cleaner, water clearer and even bird life is returning. Giving life back to nature sure speaks volumes to me. In August I will be working with Tom Parish, a friend of mine in Austin to make my first Meditation CD. So many of my students over the years have asked me to do meditation CDs; the opportunity just opened for it to happen. When I declared I was worthy, it was like the stars aligned to support my clear intention. May you be blessed with health, happiness and joy, may you always know you are abundantly cared for, supported and loved, and that each day is one more precious day to realize that you make such a beautiful difference in the world. I am also sharing some interesting articles with you. One of the greatest gifts we can give another human being is to act as their guardian. Whether this gift is related to a specific situation or is representative of an ongoing commitment, we each benefit from the association. To protect someone is to walk with them in challenging times and see them through safely to the other side. In doing this, we grow with them. And those under our guardianship derive confidence from our support and assistance, enabling them to persevere through almost any conditions. There are many reasons we feel inspired to serve as guardians to those we care for. Sometimes just holding the space for somebody allows them to do what is necessary to grow or heal. We may simply want to see that our friend or loved one is taken care of and equipped to prevail over difficult circumstances. We may also sense that we are in possession of knowledge our loved ones are lacking yet need in their current stage of development. Our offer to serve as a guardian may also be both unsolicited and unrelated to any one situation. Instead of helping someone we care about cope with a specific challenge, we may find ourselves providing them with a more general form of emotional sustenance that prepares and strengthens them for challenges yet to come. Our ability to empathize with those under our guardianship is our greatest asset because our comprehension of their needs allows us to determine how we can best serve them. Even when this comprehension is limited, however, the loving intentions with which we enter into our role as guardian ensure that our care and protection help others grow as individuals while living their lives with grace. "The best you can do for someone else is to be yourself." -- Aaron Eisenberger"
Who are you? What were you made for or made to do with your life? How do you measure yourself and against what standard? Why are you here and for whom? When do you really show up? These are the most important Who, What, How, Why, and When questions of your life. Have fun living the answers. And, if you feel a strong desire to give yourself selflessly to something much bigger than you, please remember that you must know your "self" in order to lay it down completely. And how can you possibly lay down (vs. inflict an unconscious need for validation upon others) what you do not know and fully possess?